Rajasthan Royals (RR) take on Kolkata Knight Riders (KKR) in match 21 of Indian Premier League 2019 (IPL 2019). Meanwhile, Kolkata Knight Riders have won the toss and have opted to bowl. Both the teams have made some changes for this match from their last playing XIs. Check out live score updates of RR vs KKR here. Kolkata Knight Riders have won three out of four matches thus far and will be looking for their fourth win of the season. The Dinesh Karthik-led side are currently placed third on the IPL 2019 points table with six points. Royal, on the other hand, occupies the seventh spot and have just two points in their kitty. RR vs KKR, IPL 2019 Live Cricket Streaming: Watch Free Telecast of Rajasthan Royals vs Kolkata Knight Riders on Star Sports and Hotstar Online. After three back to back defeats, Rajasthan Royals found their first success of the season after defeating Royal Challengers Bangalore (RCB). Having found their first win, Royals will be hoping to register back to back victories. However, it will very tough to outplay a team like Knight Riders. Rajasthan Royals vs Kolkata Knight Riders Live Cricket Score. Rajasthan Royals Playing XI: Ajinkya Rahane(c), Jos Buttler(w), Steven Smith, Rahul Tripathi, Ben Stokes, Prashant Chopra, Krishnappa Gowtham, Jofra Archer, Shreyas Gopal, Dhawal Kulkarni, Sudhesan Midhun. 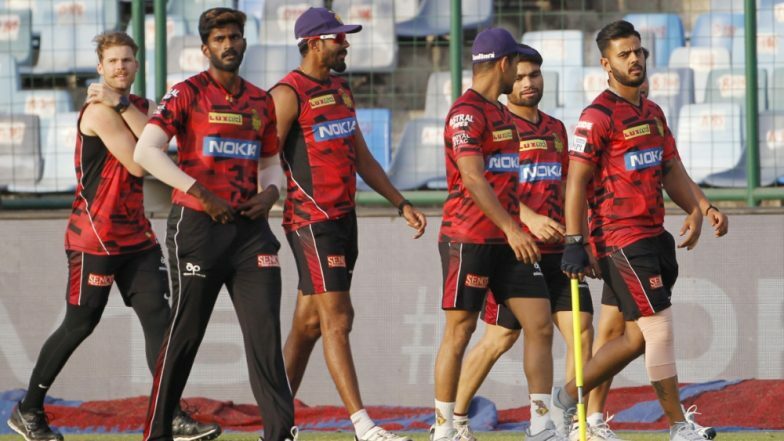 RR vs KKR, IPL 2019, Jaipur Weather & Pitch Report: Here's How the Weather Will Behave for Indian Premier League 12's Match Between Rajasthan Royals and Kolkata Knight Riders. Kolkata Knight Riders Playing XI: Chris Lynn, Sunil Narine, Robin Uthappa, Nitish Rana, Dinesh Karthik(w/c), Shubman Gill, Andre Russell, Piyush Chawla, Kuldeep Yadav, Harry Gurney, Prasidh Krishna.